The Jomox T-Rackonizer Eurorack Module is the eurorack successor of the T-Resonator and transforms temporal pulses into an analog filter network with feedback loops. Featuring two analog Moog-style cascade filters and digital delay, the module has two filter circuits, which can be integrated into feedback loops as well as controlled in the cutoff and resonance. The feedback loops also work across a digital delay/reverb chip, which is woven into the filter. The intensity of the feedback and cutoff is controlled via control voltages. The filters on the T-Rackonizer are of a discrete 24dB lowpass filter transistor cascade. 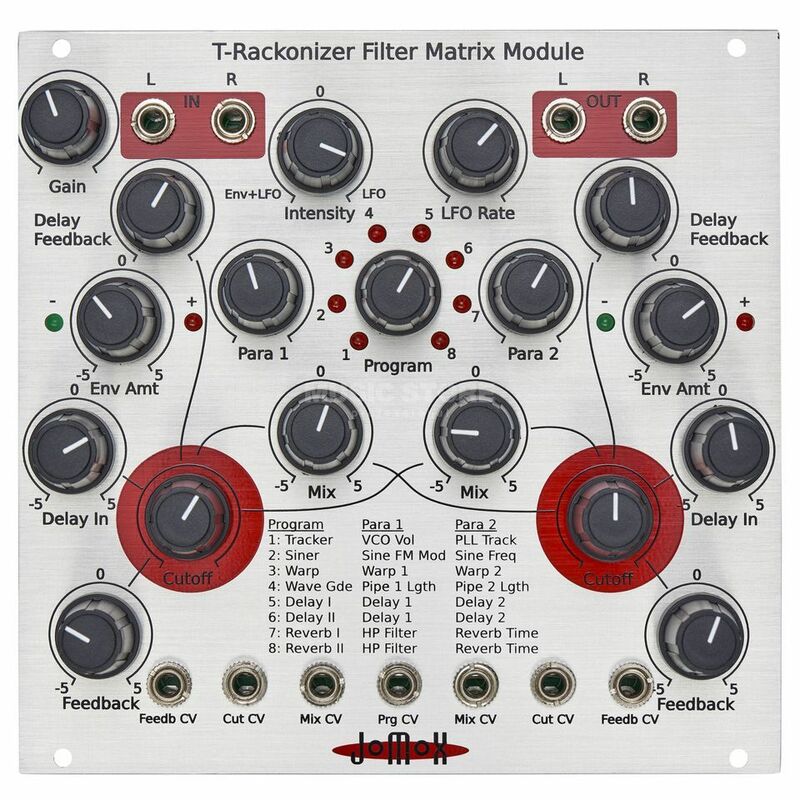 The T-Rackonizer provides a choice of 8 different algorithms, each with different delay times, waveguides and different feedback and modulations, all modulated by an LFO. The sine LFO can be re-triggered by an audio envelope or run independently. Its vast delay range can vary between one millisecond to one second with efficiency depending on the selected algorithm. Analog feedback creates organic sound whilst fresh sound patterns are easily achievable by screaming analog feedback loops, which delay each other. Thanks to the Hi-Z input, guitars can be connected directly to the module and each line level can be processed in either mono or stereo format.